Beginning on 3/18, on every Monday, The University Club will offer only its a la carte menu. In addition to its a la carte menu, the Club will feature a bicentennial special featuring locally sourced ingredients! The buffet will not be offered on Mondays starting 3/18. Please direct any questions to ucevents@uclub.ua.edu. Do you have a student graduating this spring? We welcome you to join us for our graduation lunch on Saturday, May 4th! 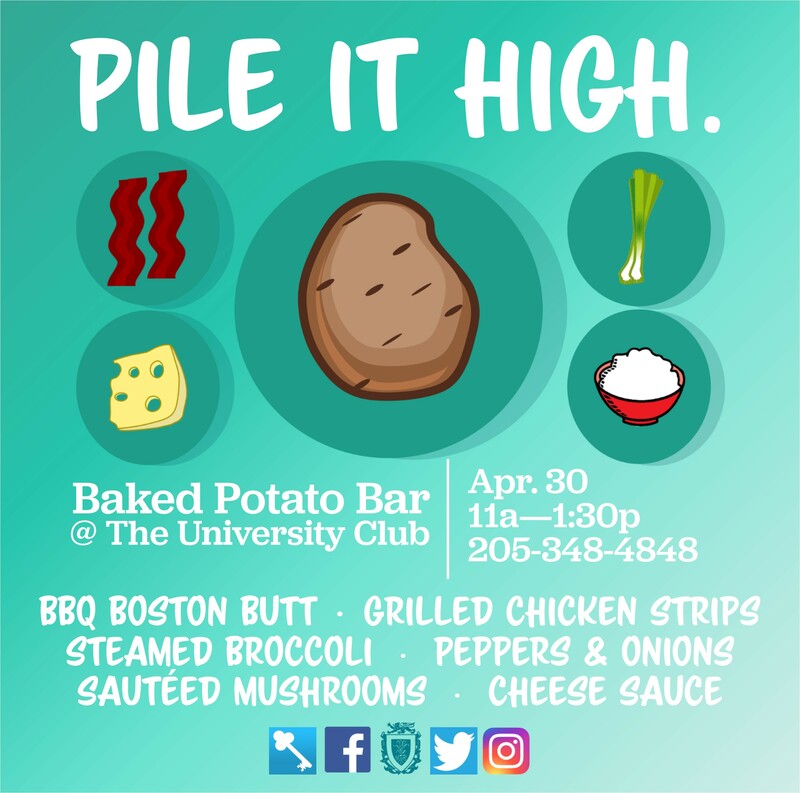 This buffet will be $16.95++/person, and we will be serving Chicken Marsala, Shrimp & Sausage Creole over Rice, Grilled Pork Loin w/ Sautéed Apples, Steamed Broccoli & Carrots, Southern Style Mac & Cheese, Mashed Baby Red Potatoes, Fried Okra, Sautéed Cabbage w/ Bacon, Corn in Butter Sauce, and Double Chocolate Cake! Reservations will be available from 10:30a--12:30p. Call 205-348-4848 for reservations! 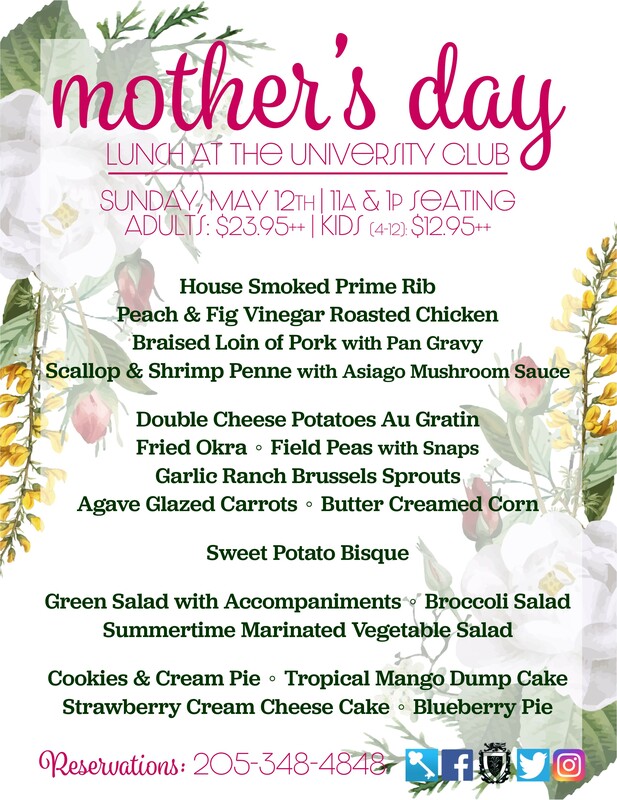 Celebrate Mom with The University Club on Sunday, May 12th! This buffet is $23.95++/adult and $12.95++/child (4-12). We will be serving House Smoked Prime Rib, Peach & Fig Vinegar Roasted Chicken, Braised Loin of Pork with Pan Gravy, Scallop & Shrimp Penne with Asiago Mushroom Sauce, Double Cheese Potatoes Au Gratin, Fried Okra, Field Peas with Snaps, Garlic Ranch Brussels Sprouts, Agave Glazed Carrots, Butter Creamed Corn, Sweet Potato Bisque, Green Salad with Accompaniments, Broccoli Salad, Summertime Marinated Vegetable Salad, Cookies & Cream Pie, Tropical Mango Dump Cake, Strawberry Cream Cheese Cake, and Blueberry Pie! YUM!!! Don’t miss out, make your reservations today! Call 205-348-4848. In May, we’re hosting Fried Chicken Day and a Burger Bar! Fried Chicken Day will be on 5/15, and the Burger Bar will be 5/24—make your reservations today! The University Club will be closed Sunday, May 26 and Monday, May 27 in observance of Memorial Day. We will resume normal operations on Tuesday, May 28th. Did you know? There are several ways you can stay up-to-date on all UClub happenings! 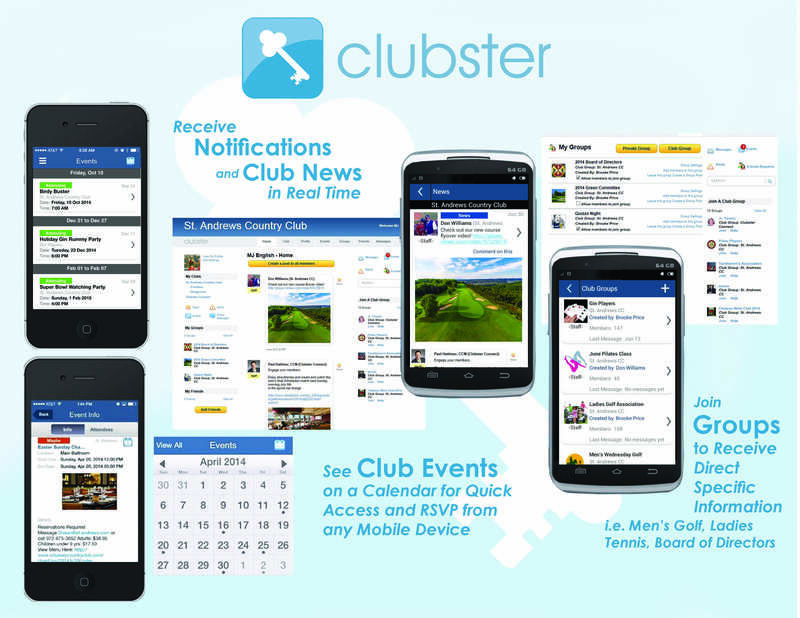 Join us on Clubster, follow us on Facebook, Instagram, and Twitter, and visit our website! We’ve always got something going on—don’t miss out on the fun! Starting September 2017, The University Club will no longer send paper statement to those whose accounts have a $0 balance in an effort to reduce waste. If you wish to receive statements regardless of balance, you are welcome to sign up to receive statements via email by contacting the Events and Membership Coordinator at ucevents@uclub.ua.edu or 205-348-4849. We appreciate your understanding with us going green! We are excited to announce that the University Club is now able to accept online payments. To make a payment on your University Club account, simply visit our website at www.universityclub.ua.edu, and select the “Make Payment” button on the main page. You will then be redirected to a secure site, Touch Net, where you will be asked for your member number, name, phone number, email address, payment amount, and credit card information. Your payment amount will come off of your monthly statement that you receive at the beginning of the month. We have tested this site several times and tried to make it as user-friendly as possible. If you have any questions or concerns, please feel free to contact the Business Office at 205.348.4850. The University Club will continue to host private parties and special events any day or evening during the week, except times when the Club is closed, spring break week and the week between Christmas and New Year’s Day. Information and reservations for special events may be made by contacting our Events Coordinator at 205.348.4849 or by email, ucevents@uclub.ua.edu. Your continued support and patronage of The University Club is sincerely appreciated.